Life has gotten fast. 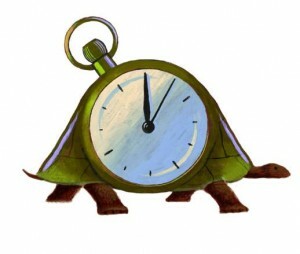 Despite my Power of Slow intentions, I have recently found myself jumping from one meeting to the next. As I build my business in the new year, it has been an inevitable pile of things-to-do. But I am committed to living the Slow amidst the maelstrom of activity. While my love prefers to go-go-go, I like a more plodding pace of pondering and preparation. In fact, for me it is a prerequisite for living a creative life. So I have started to build in Slow Moments – air pockets of time in my schedule to, well, think. Many CEOs do it. They schedule thinking time in which they solve the most troubling of dilemmas. Without it, we become machines. At least, I would. As I ambled down the sidewalk into the city today, I forced myself to go at a flip-flop pace. You can’t run in flip-flops, much less walk briskly, without falling over. Holding my container of deliverables for a few local merchants in front of me, I observed the sunlight reflecting on a pedestrian’s face. Then I stopped for a moment to feel it too. Earlier this week, I watched the snow fall persistently, illuminated by a street lamp. This afternoon, I took a moment to breathe consciously. I enjoyed a brief chat with a local handyman who came to read our meters. I looked him square in the eye and smiled. My pulse slowed. My shoulders relaxed. My lifespan may have even been extended by that moment of calm. Slow Moments can be woven into our everyday lives, no matter how hectic they might be. When we connect with our inner selves, we can neutralize the frenzy. Life may be fast. But who ever said we have to be?